Let’s hear it for the Daiquiri! 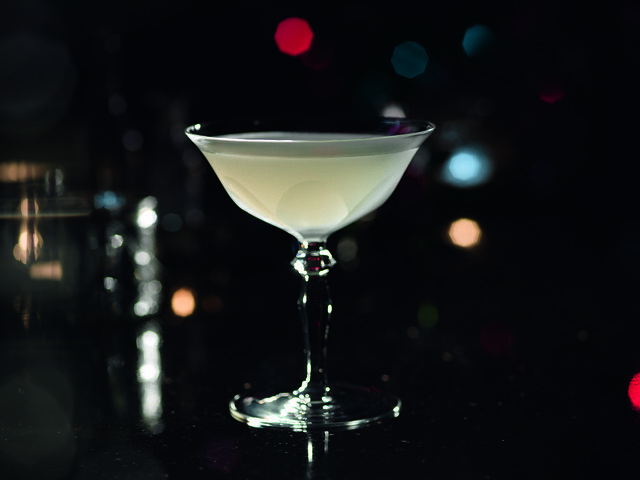 Simple yet sublime, what’s not to love about a Daiquiri? At its very basic, it refreshes the parts that most cocktails fail to reach, in the hands of someone who really knows their craft, it’s a liquid masterpiece. The real beauty of it is its unpretentiousness. When a drink calls on just three ingredients, there’s nowhere to hide. Zingy, light and fresh on the one hand, complex and packing something of a punch on the next, it’s the holy trinity of cocktail ingredients, the perfect union of sweet, sour and spirit brought together beautifully in a glass. In truth though, the drink has been around in some unnamed form for ages – rum, lime and sugar are natural partners in sunny climes after all. British sailors even had a version of it for their rations as far back as 1740 (forget the fact that the lime was there to prevent scurvy and the sugar probably added to mask the taste of ropey rum, but you get the idea). As far as the Daiquiri as we know it goes, legend has it that we owe its conception to a Mr Jennings Cox, an American engineer who set out to make his fortune working in the iron mines in Cuba. According to the stories Cox was entertaining one night and ran out of his usual tipple, gin. No gin to hand, he reached for the local spirit instead. Hello Bacardí Carta Blanca! In went some sugar, as well as some lime, water and crushed ice and before you could say, ‘hey, aren’t you a rum sour?’ a star was born. And as all good things need a name, Cox’s creation was christened Daiquiri, after the Cuban town in Santiago where Cox worked. There are other theories including the one where a Cuban engineer named Pagliuchi was visiting Cox and, after a hard day’s work made a drink with the ingredients to hand: rum, lime and sugar. The lot was served the lot over ice. The recipe went big time in 1909, travelling from Cuba to an international audience. We’ve got Admiral Lucius Johnson a US navel medical officer to thank for that. It was he who introduced the thirst-quencher of a cocktail at the Army & Navy Club in Washington DC. 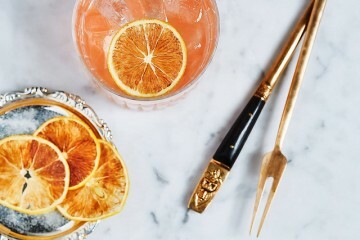 From there it became shared and refined in both Cuba and America reaching cult status when F. Scott Fitzgerald mentioned it in his novel, The Side of Paradise and Ernest Hemingway adopted the libation as his drink of choice. 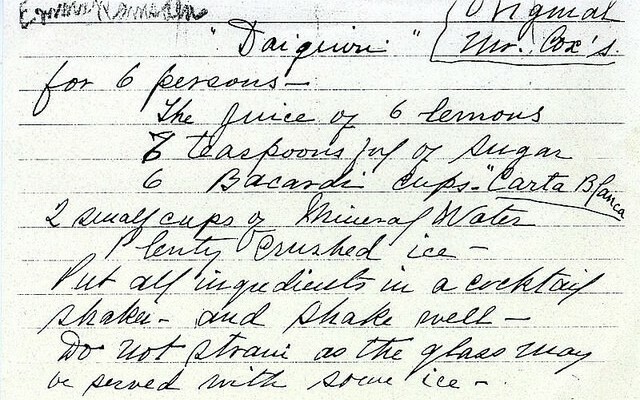 Bacardí hold the original handwritten recipe for the Daiquiri. Yes, it states lemons but it’s believed that as limes were widely available in Cuba and were also known as ‘limon’, it was this particular citrus Cox refers to in his recipe. And no, this is not for one generous serving, it’s a multi serve for six. Put all ingredients in a cocktail shaker and shake well. Do not strain as the glass may be served with some ice. Tomorrow: the importance of ingredients.